Prepare a grill for medium-high heat cooking, oiling grill grates as needed. Brush onions and pineapple with 1 tablespoon of oil and season with 1/8 teaspoon salt and pepper. Grill, flipping once, until just charred in spots and softened, 6 to 8 minutes total; transfer to a plate. When cool enough to handle, roughly chop onions and pineapple and transfer to a bowl. Add salsa, cilantro, lime juice, 1/8 teaspoon salt and pepper and toss gently to combine. Brush chicken all over with remaining 1 tablespoon oil and season with remaining 1/4 teaspoon salt and pepper. Grill, flipping once, until deep golden brown all over and cooked through, 8 to 10 minutes total. 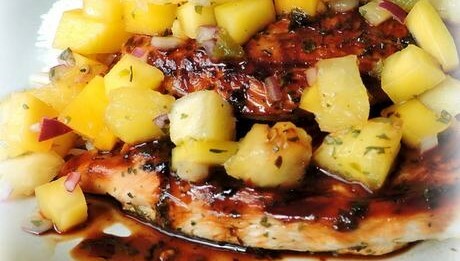 Transfer chicken to a platter; spoon grilled pineapple salsa over the top and serve immediately.